Hey guys, I have a few words to say about Slipstream. I am an EOD technician currently working in Helmand, Afghanistan. I work with Nightcrawler actually. Gundoc sent me a few bottles of Slipstream oil and a bottle of the Slipstream grease. After Slipstreaming every weapon and knife I could get my hands on, I decided to see what other field applications Slipstream has. So one day as I was cleaning the gunk buildup from one of our bomb disposal robots’ arm, I decided that a new lubrication was in order. I promptly cleaned then greased every moving mechanism of the robot arm. I have to say it was a wise choice. Not only does the arm become less gunkified,(technical term) it moves smoother and overheats less. 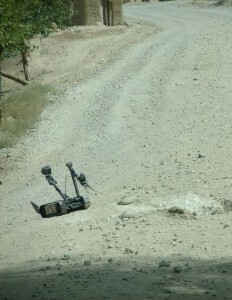 A properly working and smooth running arm is, obviously very important when you are disabling IEDs. My favorite part is that it somehow doesn’t get covered in dirt like everything else out here. 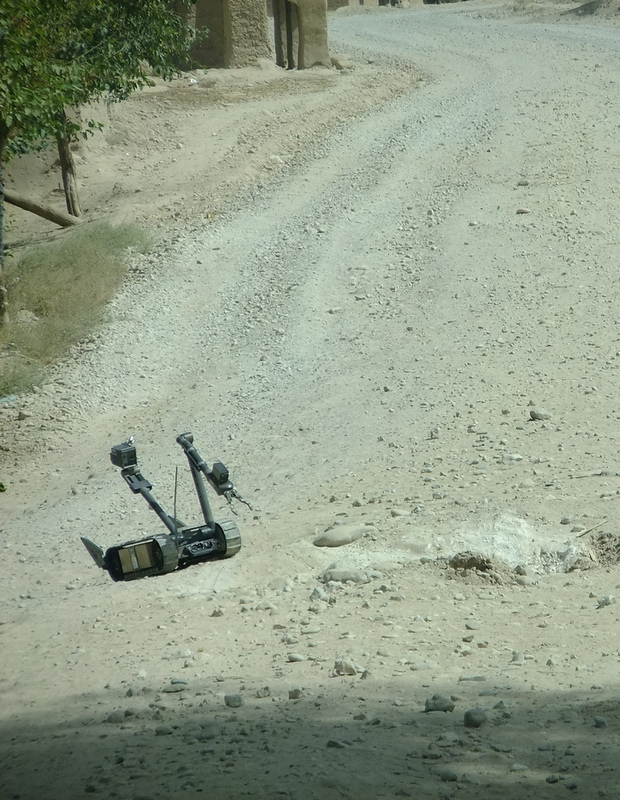 Actual Airforce Robot working an actual IED in an actual War Zone. Once again thanks to Gundoc for sending me a wonderful product. This is another reason why I am purchasing a custom build Crusader Weaponry rifle with the full Slipstream treatment. Previous PostThe Savage AxisNext PostBushmaster BA50, .50 BMG Rifle. It’s slick as a whistle again and now I’ve got no worries about lube gumming up with age and minimal lube to draw/hold dust. Quite a testimony! I’m going to order some for my small collection! Thank’s for your service and great feedback! We have word that it works on Decepticons too. Yeah, Optimus Prime just made the switch too.